Next week is the 150th anniversary of the start of the Dakota War. There were only a handful of white settlers in Pope County in 1862 during the Dakota War, but they were all touched by the conflict. In 1851, most of the area that is now known as Pope County land was included in the Treaty of Traverse des Sioux. The U.S. promised $1,665,000 to the Sisseton & Wahpeton Dakota for 21 million acres of land. They payments were to come in installments and include both gold an necessary supplies. The supplies arrived on time, but were held in warehouses, waiting for the gold to arrive. The Dakota were denied access to their hunting grounds, limited to the reservation lands. With no means of acquiring their own food, and their promised food supplies held under lock and key to rot in warehouses, the situation became desperate. The story varies somewhat, but it is generally agreed that several young men shot a settler after trying to steal eggs from his chickens. The Dakota elders counseled against starting a war they couldn’t possibly win, but in the end the passions of the younger men prevailed and war was declared against the settlers. After a month of fighting, hundreds of settlers and scores of Dakota were killed. Over 1,000 Dakota were captured and held through the winter at Fort Snelling. Abraham Lincoln pardoned most of them but in the end 38 Dakota men were executed in Mankato. It was the largest mass execution in U.S. history. 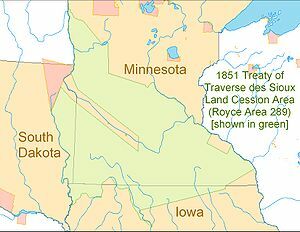 After the war, the treaty was considered void and the Dakota were removed to South Dakota. Less than 20% of the promised money was ever paid. It was a very dark period in our country’s history and is overshadowed by the Civil War, which was happening at the same time. In 1862, there were 5 families in Lake Johanna Township. All of them safely fled to Paynesville. 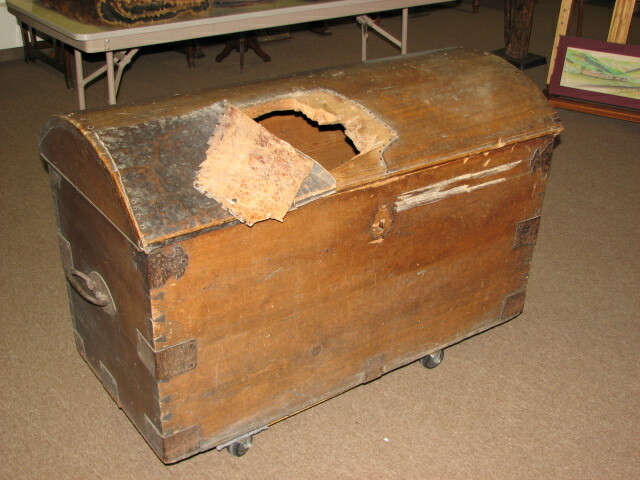 The trunk in our collection belonged to Gregar Halvorson Stordahl and was left behind when the family fled. It was discovered by the Dakota braves, who scratched off the lock and chopped a hole in the top. But the trunk and the rest of the farm were largely spared and the family was able to return. The Joseph Hutchins family lived in Leven township. They were warned by an unknown person arriving from the west. They hastily gathered their 5 children and fled to Sauk Centre, leaving all their livestock behind. Shortly after arriving in Sauk Centre, Mr. Hutchins and a small company of soldiers returned to the farm to attempt to retrieve the livestock, but found all the animals killed and the buildings burned to the ground. Mr. Hutchins sent his family to Minneapolis while he harvested the crops and rebuilt the farm. In Grove Lake township, there were only 2 families, the Stablers and the Van Eatons. Rev. Thomas Van Eaton, Methodist minister and farmer was visiting the Stablers with his family when Mr. Stabler’s brother arrived with news of the uprising. Both families immediately fled to Sauk Centre to seek protection in the stockade. The Van Eatons had 5 children, including Thomas C. Van Eaton who was one of (if not the) first white children born in Pope County. A few days after arriving in Sauk Centre, Rev. Van Eaton returned home to look after the livestock and gather a few possessions. He found that everything had been destroyed. He was then attacked by the Dakota and beheaded. The Grove Lake Church still stands on the property he owned. This entry was posted in Collection Notes, Local History and tagged 1862, A-Z, Dakota Conflict, dakota war, Dean Stabler, Glenwood, Gregar Halvorson Stordahl, Grove Lake Township, Indian uprising, Lake Johanna Township, Leven Township, massacre, Minnesota, Pope County Minnesota, Pope County Museum, Sioux Uprising, Thomas Van Eaton. Bookmark the permalink.